Place all the ingredients in the crock pot in the order listed above. Cook in the crock pot on high for at least 6 hours. Remove the chicken and shred. Return to the crock pot and mix into the sauce. Butter the inside of your buns or rolls. Place them on a cookie sheet. Broil them in the oven on the second highest level for the oven rack (this prevents burning). Broil until golden brown. You want them toasty because this bbq chicken is so moist and saucy you will end up with soggy bread if you don’t toast them. 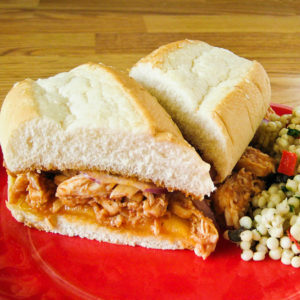 Sandwich bbq chicken inside toasted buns or rolls.